Comedy Central announced today that Jon Stewart will be leaving The Daily Show later this year. A presidential election cycle looms, but one of the men most associated with covering presidential politics since the first election of George W. Bush won't be sitting in his usual spot: Comedy Central confirmed on Tuesday that Jon Stewart is stepping down later this year from his post at The Daily Show. Stewart took over the show from original host Craig Kilborn in 1999, and under him, it became not just a popular comedy series, but a source of news and information for its audience, devoted in spirit if not enormous in numbers. Comedy Central will be hammered with speculation until the show's precise future is known, but the network said in its official statement that The Daily Show is a "cultural touchstone" and vowed it would "endure for years to come." Presumably, that means it intends to find a new host rather than replace the entire show with something else, as it did when Stephen Colbert left for CBS. The Colbert Report ended and Larry Wilmore's The Nightly Show debuted. Stewart will reportedly address his departure on Tuesday night's show, but not a lot is known yet about the reasons for this decision — although a guy doesn't always need an overwhelmingly specific reason to leave a job after more than 15 years. Stewart took a leave of absence in 2013 to write and direct his first feature film, Rosewater, based on the memoir of a journalist imprisoned in Iran. Perhaps he caught the directing bug — he would not be the first. Perhaps he's done what he can in this form and longs to try another. Perhaps he can't face another election. People leave the jobs that made them famous and do OK for themselves. Ask George Clooney. Whatever his reason, Stewart leaves behind not only a massive archive of episodes of this show, but also influence that extends to other shows and even networks: at Comedy Central, there's Wilmore, at CBS, there's Colbert, and at HBO, there's John Oliver — who parlayed his guest-host gig for Stewart during that Rosewater leave into a well-regarded project of his own. Much will be said in the months to come about Jon Stewart's Daily Show legacy, but on the night of this announcement, it seems somehow apt that Stewart's fake-news departure is hopelessly tangled in media news with the suspension of Brian Williams from NBC's flagship nightly news program. There's a fine line at times between news and comedy. A fine, fine line — and Jon Stewart will soon leave it to others to stomp on it. The premiere name in fake news will be leaving his anchor desk. UNIDENTIFIED MAN: From Comedy Central's world news headquarters in New York, this is "The Daily Show" with Jon Stewart. 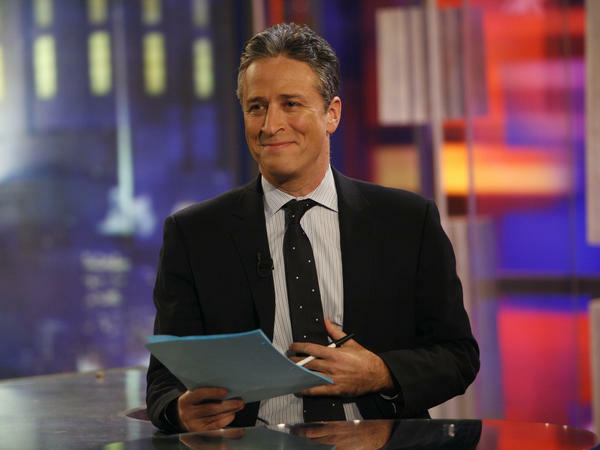 SIEGEL: Jon Stewart will leave "The Daily Show" this year. Comedy Central made the announcement late today. For more on this, we're joined by NPR's Linda Holmes, who's our pop culture blogger. Hi, Linda. SIEGEL: Do we know why Jon Stewart is leaving "The Daily Show?" HOLMES: We really don't. He's reportedly going to address it on tonight's episode of his show. Maybe he'll say a little more then. He did take a leave of absence in 2013 to make a feature film called "Rosewater" which came out in 2014. Perhaps he's interested in more directing. I thin we won't know until he says more. SIEGEL: So no word on his future plans, in that case? HOLMES: No, I don't think so - not yet. SIEGEL: How would you describe the mark that Jon Stewart has made on that show and beyond it? HOLMES: Well, he was not the original host. Craig Kilborn hosted that show for the first couple of years, and I think once Jon Stewart came to "The Daily Show," it increased in credibility and visibility and really became an institution. And beyond that, he also then sort of spun off Stephen Colbert into "The Colbert Report." Obviously, he's taking over for David Letterman at CBS - also, Larry Wilmore who now has "The Nightly Show" at Comedy Central. And John Oliver who sat in for Jon Stewart during that leave of absence now has a weekly show at HBO in a very similar format called "Last Week Tonight." So he's got a lot of people who have followed in his footsteps kind of. SIEGEL: Will Comedy Central continue "The Daily Show" without Jon Stewart? HOLMES: The Comedy Central announcement indicates that they will. They said that the show was a cultural touchstone and would endure for years to come. So presumably, they don't merely mean endure as a - as an artifact. So presumably, they intend to pick somebody else. The speculation over who that person will be will be fast and furious to say the least. SIEGEL: But that's some pair of shoes to fill on that program, and do you think that "The Daily Show" can actually be successful without Stewart? HOLMES: I do. I think John Oliver's guest stint in 2013 was very successful. I think that if you can follow Johnny Carson as the host of "The Tonight Show," you can follow Jon Stewart as the host of "The Daily Show." It is a format that is supported by a lot of terrific writers and a lot of people who work really hard. It's not just a one-man show. SIEGEL: Do we have any idea why this announcement would be made on a Tuesday night in February of no particular importance? HOLMES: You know, I think the timing on these things always comes out. You know, as we go along, we'll presumably learn a little but more about how this has all been decided. And at some point, somebody will figure more of that stuff out, but it kind of came out of nowhere, as far as I know. I had heard - I had not heard anything until today. SIEGEL: OK. Thank you, Linda. SIEGEL: That's NPR's Linda Holmes who writes our pop culture blog, "Monkey See." She's reporting on Comedy Central's announcement today that Jon Stewart will be leaving "The Daily Show." Transcript provided by NPR, Copyright NPR.